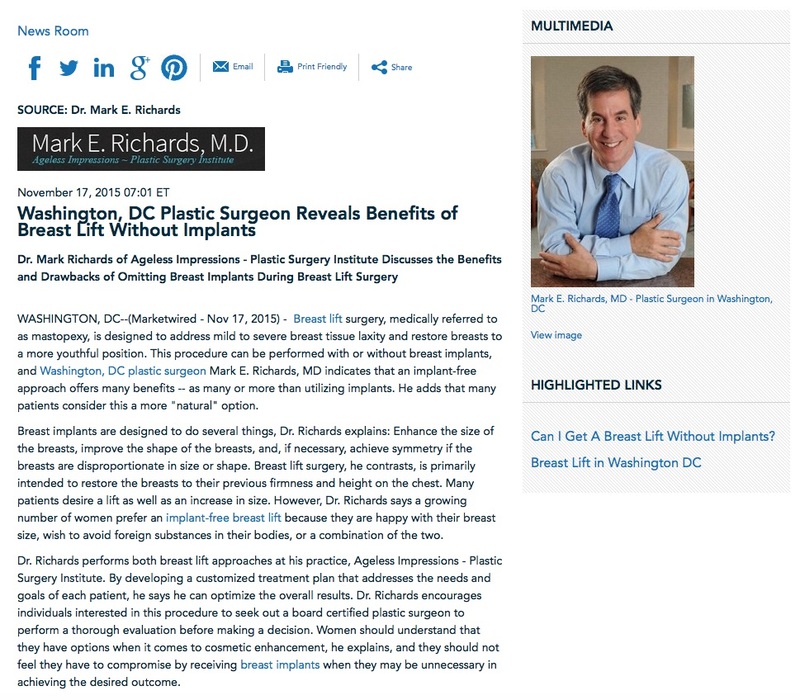 Dr. Mark Richards of Ageless Impressions – Plastic Surgery Institute discusses the benefits and drawbacks of omitting breast implants during breast lift surgery. Washington, DC — Breast lift surgery, medically referred to as mastopexy, is designed to address mild to severe breast tissue laxity and restore breasts to a more youthful position. This procedure can be performed with or without breast implants, and Washington, DC plastic surgeon Mark E. Richards, MD indicates that an implant-free approach offers many benefits — as many or more than utilizing implants. He adds that many patients consider this a more “natural” option. Breast implants are designed to do several things, Dr. Richards explains: Enhance the size of the breasts, improve the shape of the breasts, and, if necessary, achieve symmetry if the breasts are disproportionate in size or shape. Breast lift surgery, he contrasts, is primarily intended to restore the breasts to their previous firmness and height on the chest. Many patients desire a lift as well as an increase in size. However, Dr. Richards says a growing number of women prefer an implant-free breast lift because they are happy with their breast size, wish to avoid foreign substances in their bodies, or a combination of the two. Dr. Richards performs both breast lift approaches at his practice, Ageless Impressions – Plastic Surgery Institute. By developing a customized treatment plan that addresses the needs and goals of each patient, he says he can optimize the overall results. Dr. Richards encourages individuals interested in this procedure to seek out a board certified plastic surgeon to perform a thorough evaluation before making a decision. Women should understand that they have options when it comes to cosmetic enhancement, he explains, and they should not feel they have to compromise by receiving breast implants when they may be unnecessary in achieving the desired outcome. Dr. Richards was certified by the American Board of Surgery in 1989 and is actively certified by the American Board of Plastic Surgery. He attended Yale for his undergraduate degree and earned his medical degree from the University of Maryland School of Medicine. He completed seven additional years of specialized training and is an advocate of continuing medical education (CME). Dr. Richards has been voted a Top Doctor by US News & World Report and one of America’s Top Surgeons by the Consumer’s Research Council. He is a member of the American Society of Plastic Surgeons (ASPS). Dr. Richards is available for interview upon request. For more information about Dr. Richards and his practice, please visit drmarkrichards.com and facebook.com/drmarkrichards.